Moldavite specimen with Moldavite infused oil. The "Extraterrestrial gem" Moldavite is a unique & rare green gem much different from the crystals that we are most familiar with grown on Earth. Moldavite was in fact sent to us from the Cosmos 15 million years ago! While scientist differ in theories regarding moldavite's origin, nearly all agree that it fell in the form of a large meteor. Moldavite is classified as a tektite. Tektites are glass stones created by the impact of large meteorites on Earth’s surface. When a meteorite of sufficient size, enters earth’s atmosphere, the force of the impact causes a melting of terrestrial earth, which fuses with the meteorite material. This molten substance then re-enters the upper atmosphere, and falls again to earth in the form of rather small, molten, aerodynamic shaped stones. Tektites are only found in four strewnfields (dispersion areas) on our planet. Of these four sources of tektites, Moldavite is the most highly prized, because of its unique texture, translucent green color and fascinating shapes. No other substance caused by an extraterrestrial event, can be faceted, polished, and has the classification of a gemstone. These rare and unique stones can only be found in the Czech Republic. Moldavite stone is the ritual stone for integration of body, mind and spirit and can be a great catalyst for change, even if a person is simply in possession of it. In Judy Hall's book "The Crystal Bible" she states that moldavite is "a useful stone for star children and sensitive souls who find it difficult being in incarnation on the earth, and who cannot adjust to suffering and deep emotions." When placed on the heart, Moldavite uncovers the reasons and purpose for why one is here, and eases the "homesickness" for those whose origin is not Earth. True genuine Moldavite is getting more rare and the price is going up, the counterfeiters are getting better at their craft. 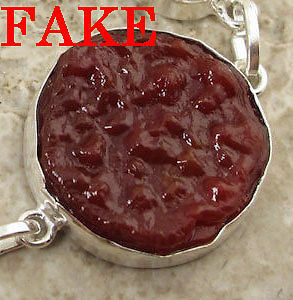 Some fakes are very convincing, especially when mounted in jewelry where the signs of seams are hidden. Some counterfeiters are even now creating a mold from an actual genuine piece of Moldavite and replicating the color and texture to almost close to perfection. The best way to catch this is by noticing the stone is flawless and the price asked, which is a very low price usually. If the price is too good to be true, most the time it is a sign of a possible fake. There are sellers demanding higher prices for these fakes also. If the Moldavite you are examining is bright vibrant green in color, you are most likely looking at a fake Moldavite that was produced by melting green glass bottles. Also, be aware that the larger the Moldavite, the higher the price, as most genuine Moldavite is sold by the gram. If the seller claims the stone was mined anywhere but the Moldau River valley in the Czech Republic, it is most definitively a fake. If the Moldavite looks really wet or shiny, like melted glass, you are more than likely looking at a fake Moldavite. Now, there are some sellers that state up front that their Moldavite is lab-created, created or synthetic, which is just green glass made and formed to look like Moldavite. Just be aware that if it states lab-created, created or synthetic, you are getting green glass or maybe worse. Some fake Moldavite on the market isn't even green, which is a true sign that it is definitely fake. Below here are photos of real and fake Moldavite so that you may see the difference for yourself.